In the spring of 1914, I had the pleasure of having my brother, Commander Edward Tyndale-Biscoe, and his wife with me at our annual school camp at the Wular Lake. I had anchored our twelve-oared cutter about two hundred yards out in the lake and had lined up our boys for a race from the shores round the cutter and home, when the lambardar (headman) of the village came up to me and asked if the men of his village might race with our boys. I said I should be delighted, but as I had not idea that they could swim, I asked him since when had they learned the art of swimming, and he answered: “Ever since your schoolboys swam across the lake, all the boat people here have learnt to swim.” My thoughts went back to that day when we first sailed across the Wular and heard the news of eighteen Wular people having been drowned the day before, and my determination to bring to pass what everyone said was impossible. Our efforts were not in vain. Late in the year cholera broke out again in the city and too its toll of hundreds of lives. Amongst those who were seized was the headmaster of the Government School who had been a teacher in the Christian Boarding School at Batala under the principalship of my brother George. This man had only lately arrived in Kashmir, and I warned him of the danger that he and his family were in, if they lived in the city. But as he lived near our Central School I trusted that he would be safe, for there we kept medicine handy, masters being in attendance every night with lanterns and bicycles ready to dash off in any direction where medicine was needed. He said: “I am sure I shall not be attacked by cholera.” Unfortunately, when he was attacked he, like many others, tried to make himself believe that he had only diarrhea and would not send for the help, which was at hand. As soon as I heard that he had been attacked by cholera I rushed down with medicine to his house and found him insensible, in the third stage of cholera and, although we brought a doctor, it was too late and he passed away. Samuel Bakkal and two Brahman masters came down to his house to put his body in the coffin. As Samuel Bakkal and I were about to lift him into the coffin our two Brahman masters asked if they might help us. I purposely had not asked them to help because I knew that it was defilement for Brahmans to touch a dead body. So I was very pleased at their request and we all four put the corpse in the coffin. It was always a great joy to me to see my men doing acts of kindness in this terrible epidemic of cholera, for it is through stress and danger that men are born. During this epidemic a curious thing happened. Near where I was standing one day was an old man whom I saluted. Thinking that I was a stranger he bgan pointing out to me the various places of interest in the city which lay like a map before us. Pointing to the right on the river bank he said: “That is Biscoe Sahib’s school,” and then to the left he pointed to the mission hospital of which he spoke in terms of gratitude, saying : “When I was a boy a very holy man lived in a cave under the hospital hill. He was very old but he said he would not die until a white man arrived from the West who would teach me (the narrator) the way to God. 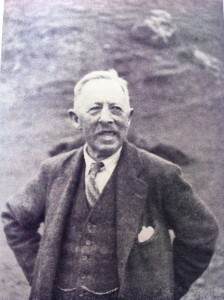 Then, in the year 1880 Doctor Arthur Neve arrived to work in the hospital with Doctor Downes. When he saw Doctor Arthur Neve he had said to himself: “This is the man I have been waiting for, who will teach the Kashmiris what is good,’ and then he breathed his last.” These last words of this holy man certainly became true. About Canon C.E. 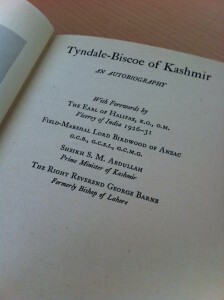 Tyndale-Biscoe (from his book): He was educated at Bradfield and Cambridge where he took his B.A., and coxed the Jesus College boat, head of the river for three years, and coxed the Cambridge eight to victory in 1884. He was awarded the Kaiser-i-hind medal, 1st Class and Bar for his service to India.